We use low VOC (volatile organic compound) interior paints to minimize or prevent the outgassing of toxic vapors. It is fundamentally important in the prevention of mold growth and mildew to prevent the invasion of water into the home, whether this be in the solid form or vapor. We will use 15 pound roofing paper, Tyvek® DrainWrap™ or a product similar to it. Tyvek® DrainWrap™ helps provide enhanced drainage behind claddings such as primed wood (all six sides), fiber cement siding, and foam board applied over flat substrates. Vertical grooves on the surface of Tyvek® DrainWrap™ make it a superior moisture barrier, engineered to channel bulk water away from wall systems and drain safely to the outside. The unique material structure of Tyvek® DrainWrap™ helps hold out bulk water, while allowing water vapor to pass through it, promoting drying in the wall system, which can help prevent mold and water damage. The unique non-woven fiber structure of Tyvek® DrainWrap™ also helps prevent air movement through the walls, contributing to a more energy efficient home. [Source: Dupont]. However, a common practice encouraged by the International Building Code is to install a vapor barrier, in the form of polyethylene (visqueen) sheeting between the wall framing and the drywall. The problem occurs as moisture vapor migrates from the inside of the home to the exterior. This moisture and/or vapor will become blocked by the waterproof visqueen, potentially trapping water or condensation behind the drywall. This trapped moisture will feed any available mold spores, causing mold to grow. This is why we use Class I Vapor Retarder paint, which is also encouraged by the International Building Code and is optional to the standard use of visqueen inside the walls. By placing the vapor barrier on the inside face of the drywall via paint, the potential for condensation buildup behind the drywall is eliminated along with the food source for molds and mildews. Another problem with the use of visqueen vapor barriers in walls behind the drywall: When masonry sidings, including brick, block and cement board claddings get wet, they are porous and collect moisture. In a perfect world, they would dry out when the sun warms them and no problems would occur. However, in warm weather, many houses have air conditioning – cooling for the warm weather. Air conditioning creates a lower pressure inside the home than the air outside. So, when it is warm outside and the air conditioner is running inside, the moisture stored in the masonry and cement sidings will move to the inside of the house and, once again, get trapped by the visqueen on the walls. In this situation, there are usually generous buildups of condensation and it does not take long for mold and mildew to buildup on the framing members – out of sight and out of mind. For this reason, it is strongly advised NOT to install visqueen on the walls of houses with air-conditioning. Oriented Strand Board (OSB) typically used in wall, floor and roof sheeting has potential to harbor unseen mold problems. Subject to wetness, plywood will readily soak in water or moisture, but will dry very fast once conditions change. OSB, on the other hand, absorbs moisture more slowly but once wet is likely to stay that way. OSB also has a tendency to curl or warp around its edges, which can sometimes be seen outlined in roofs constructed with OSB. Mold infesting wet or damp OSB materials is a potential health hazard. Once covered by siding, shingles or flooring materials, OSB contaminated with mold becomes a hidden problem that is likely to get worse over time. [Source: healthyhouseinstitute.com/hhip-769-Oriented-Strand-board-OSB]. OSB and exterior plywood both contain a formaldehyde-based, waterproof resin called phenol-formaldehyde (PF). Compared to the widely used urea-formaldehyde (UF) resin, PF resins emit relatively low levels of formaldehyde. [Source: healthyhouseinstitute.com/hhip-769-Oriented-Strand-board-OSB]. However, OSB contains more glue than plywood. Therefore, although the outgassing is low in each, the outgassing is more in OSB than in plywood. UF resins, which are found in composite materials used in cabinets, shelving, paneling and other products, are more toxic and outgas significantly more formaldehyde than PF-based glues. [Source: healthyhouseinstitute.com/hhip-769-Oriented-Strand-board-OSB]. It is for this reason, we do not use particle board in our subflooring, shelving or cabinets. Many brands of carpeting also use the UF resins or equivalent. Carpeting and pads may also hide dust, allergens and mold spores. For these reasons, our standard construction includes composite wood floors or other neutral materials for flooring. 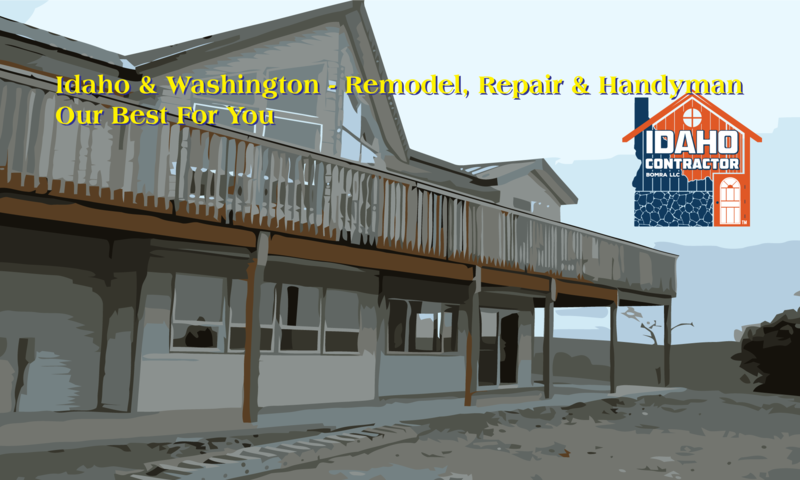 Idaho Contractor desires to build you a home that you will enjoy and will provide for a healthy life, as well. Call us today to see how we can help you enjoy a healthy home.